Assado is designed by one of Britain’s most popular chefs, Cyrus Todiwala. 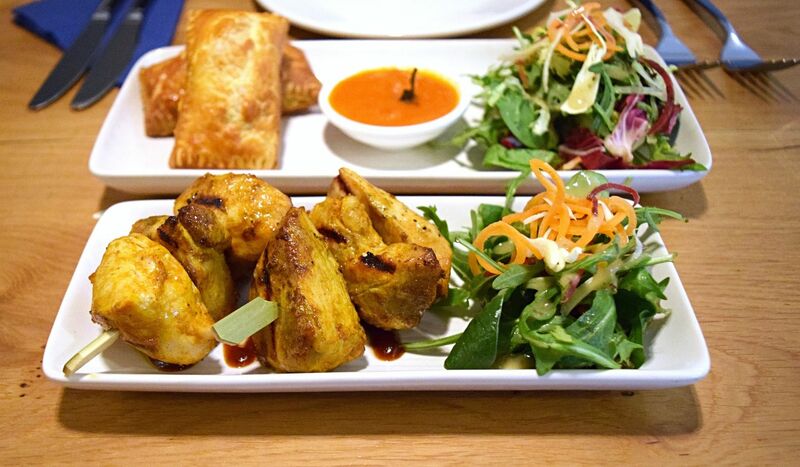 Based in the Hampton by Hilton London hotel on Waterloo Road, the vibrant menu is a combination of unique dishes inspired by Indian’s culinary traditions. The concept of Assado is quality food without the hassle of pre-booking and also quick service. I took a friend down for dinner last week to try it out. Entering the restaurant it’s obvious that it deliberately a relaxed dining experience, with its open plan layout and bright surroundings. There are a number of booths across the back wall and a number of two and four seater tables. On our visit we were one of the first people in the restaurant, we were seated in a booth and served promptly. Drinks came very quickly as did a bowl of mini poppadoms and sauces. Reviewing the menu, Paddy and I decided to go for a mix of the more obvious Indian dishes and compliment it with the Portuguese inspired dishes. As a huge Indian fan I ordered the traditional chicken tikka as a starter and Paddy went for the Assado pork puff. As Assado means roast in Portuguese it was obvious many of the dishes were roasted in the large open oven that is visible throughout the restaurant. 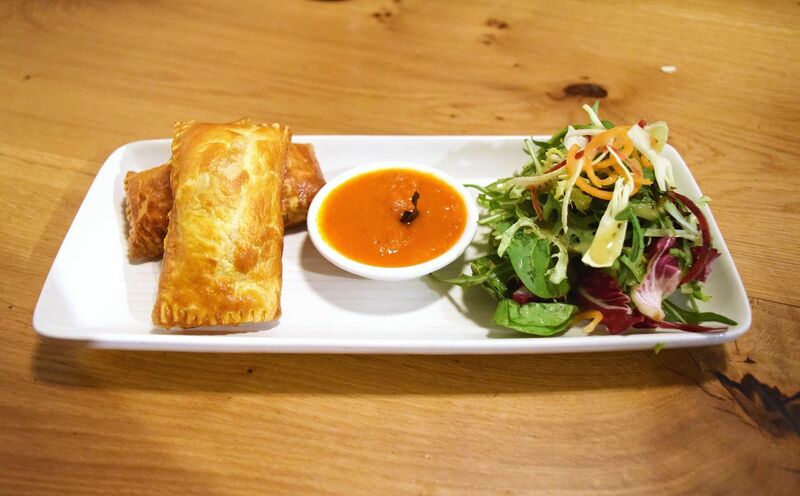 The pork puff was light, delicate tasting and with a good mix of mince meat and chorizo to compliment the light crispy puff pastry. They were very lightly spiced for additional flavouring and were served with a traditional makhani (tomato and butter) sauce. The chicken tikka was very moist which often isn’t the case with a non gravy chicken tikka dish and the chicken was flamed grilled and marinated well, it was very tasty especially eaten with the decorative sauce served underneath the kebab. With two smaller kebab’s I definitely wouldn’t have needed much larger before my main, however if you are hungry it might be recommended to go for another starter and eat it like tapas with your fellow diner. For mains I went for chicken caldeen curry, if you have not had a caldeen curry before it’s a lighter slightly fruitier and coconut flavoured curry. 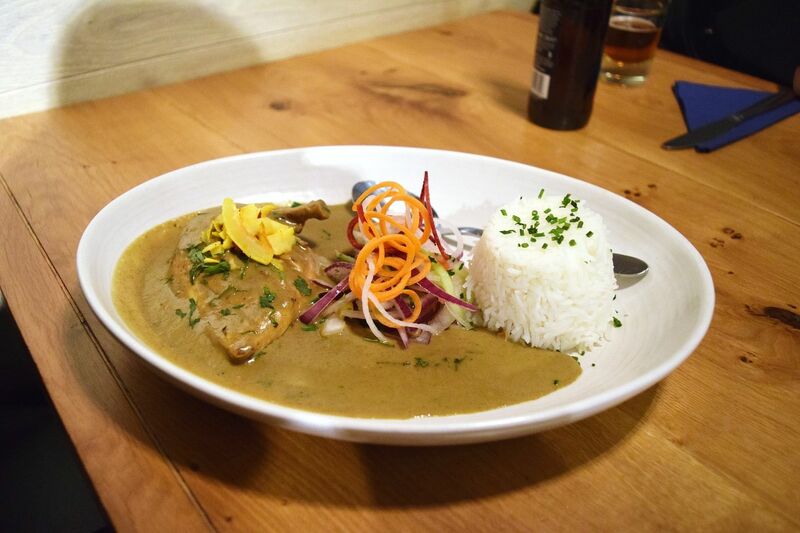 The Assado version was a whole breast of chicken cooked in a mild coconut & cashew nut curry served with steamed rice. The curry is ideal for someone who is not a spice fan. It is a very delicately spiced curry, mixed with coconut which is the dominant flavour and finished with toasted cashews. The crunch of the toasted cashews went really well with the thicker sauce especially with the succulent and moist chicken. It is a dish you will want to eat all elements of the food in one mouthful. We also ordered garlic, coriander and green chilli naans which went really with the caldeen curry gravy. 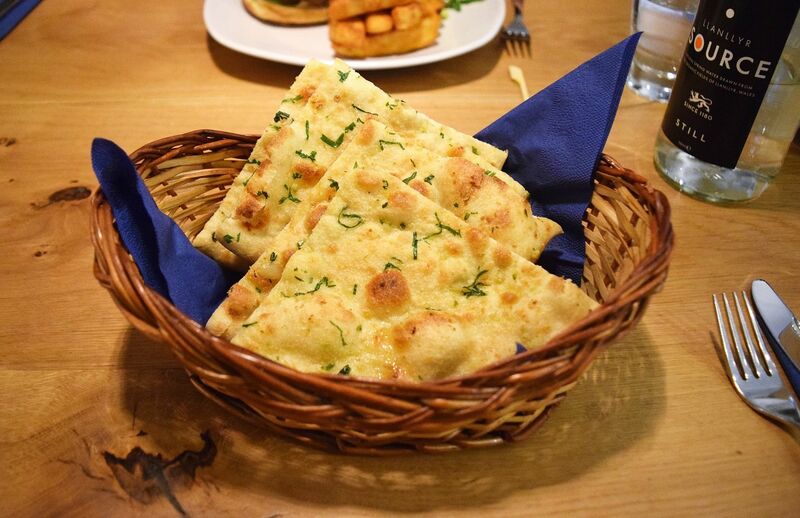 If you are used to the heavier, or more fluffy naan breads from a traditional curry house then these definitely are not them, the naan’s are lighter, crispier and something that compliments the richer dishes with a thick sauce. Paddy had the Bombay beef burger, the burger was a fair size and the large single beef patty was spiced with fresh ginger, green chilli and coriander. 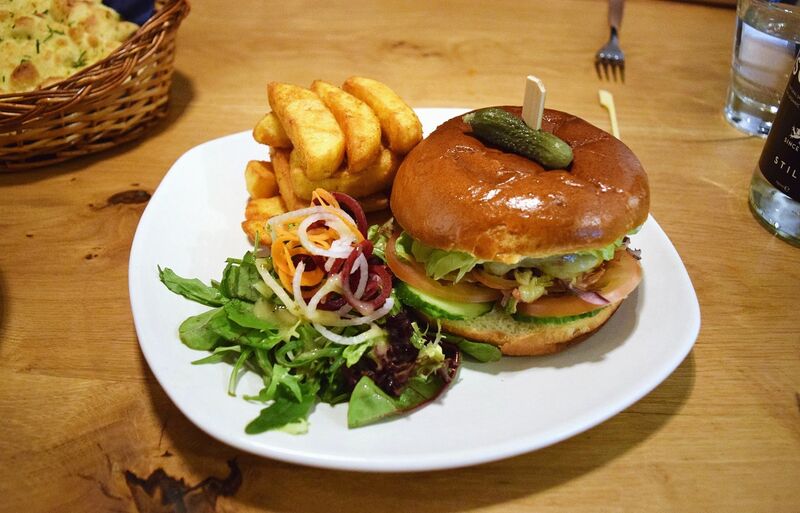 The burger is garnished with quite a lot of salad so if you are not a fan you will want to pick them out. As you would expect the bombay burger was served with spiced jenga style chips and salad. 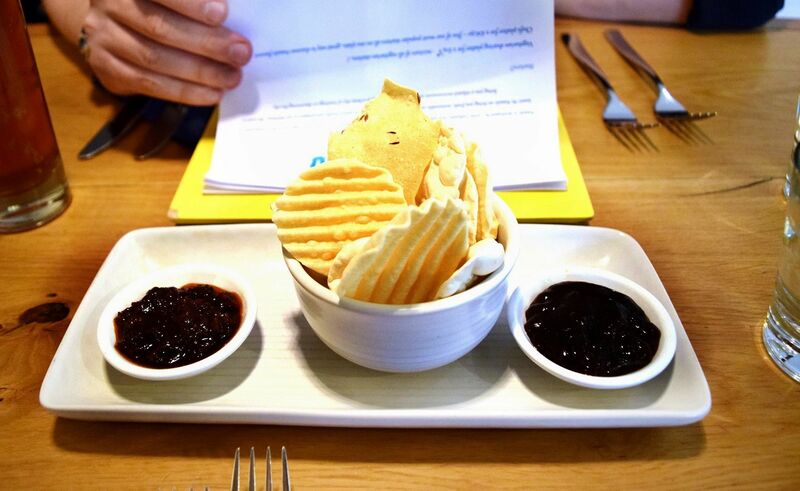 The chips were a cross between potato wedges and chips, as you can see by the pictures they are definitely not fries. Before our visit I read that the Portuguese custard tarts were a must order, so of course I ordered the ‘Pasteis de Nata’. 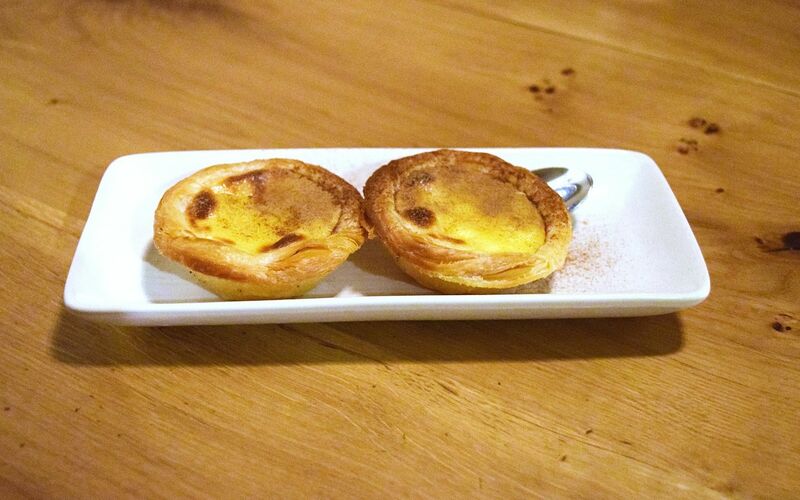 After being lucky enough to eat at a number of good Portuguese restaurants and at Portuguese friends houses the tarts definitely held up against others I have had and I really enjoyed the slightly spiced dusting. 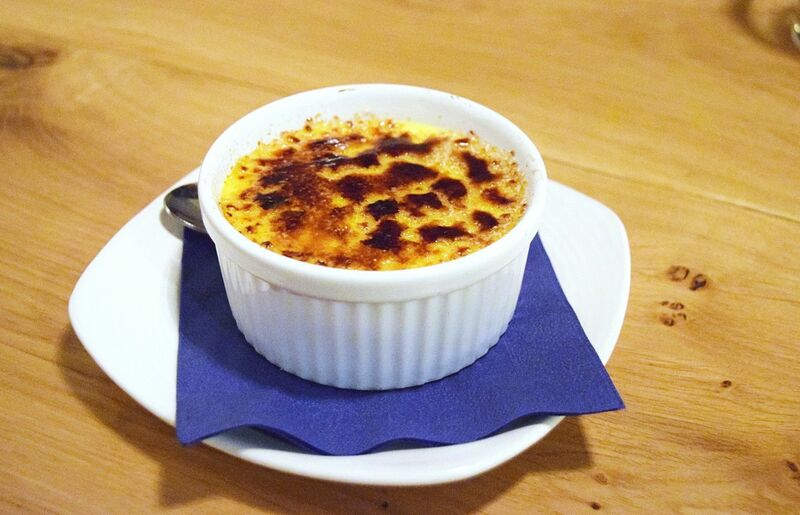 Paddy chose the saffron & cardamom crème brulee, it was a good size crème brulee and the fear I had was that cardamom and saffron would have been too overpowering but they were not. If you are a classic crème brulee fan this isn’t too much of a change, but if you are not a cardamom fan I would pick something else. Having read a number of reviews before my visit I was not sure what to expect, however all in all Assado is a solid Pan Indian restaurant to visit. It’s a relaxed restaurant with decent service and a good variety of fusion food. Being a huge spice fan I have since kicked myself for not trying the spicier curries.